The opera THE DOLL BEHIND THE CURTAIN is based on the short story of the same name by the revered Iranian writer Sadeq Hedayat (1903-­‐1951). Hedayat was Iran’s first modernist writer. Though there are echoes of Edgar Allan Poe and Franz Kafka in his profound and unsettling fiction, his vision and his voice are unique in literature. THE DOLL BEHIND THE CURTAIN is a modern masterpiece exploring loneliness, the mysteries of human sexuality and the clash of cultures. Amir Mahyar Tafreshipour’s opera, premièred here this week, is the first Iranian opera ever to be performed in England. Tafreshipour has created an original and challenging work of musical theatre, drawing from the culture of his native Iran, while exploring themes that are universal.THE DOLL BEHIND THE CURTAIN probes the troubled psyche of an individual caught between tradition and modernity, between duty and desire. The setting is Le Havre and Tehran during the 1930s. Mehrdad, a shy, introverted young Iranian, has completed his studies at a lycée in Le Havre. In the days before his return to Iran, he discovers a beautiful mannequin in a junk shop. For the timid Mehrdad, this alabaster doll becomes an object of obsessive desire. He buys it from the shop’s sinister owner, Tombeau, believing that he has found a beauty that is flawless and unchanging – a passive object of adoration with which to share his secret life. Returning to the family home in Tehran, alienated from his parents and his adoring fiancée, Bita, Mehrdad shuts himself away in his room with the doll. But the inanimate mannequin is no longer the passive recipient of Mehrdad’s adoration, but a demanding mistress. Bita secretly visits Mehrdad’s room to confront her rival. There she hatches a desperate plan to recapture Mehrdad’s love. Dominic Power is a radio dramatist and librettist. With Andrew Hilton, he has edited performance texts of Shakespeare for Shakespeare at the Tobacco Factory, Bristol. He has written the libretto for Peter Wiegold’s opera Brief Encounter and for End of the Line, a musical installation by Peter Wiegold. Rhys Bowden (tenor) studied for a degree in music at Girton College, Cambridge before completing a PGDip in Vocal Studies at the Royal Academy of Music. 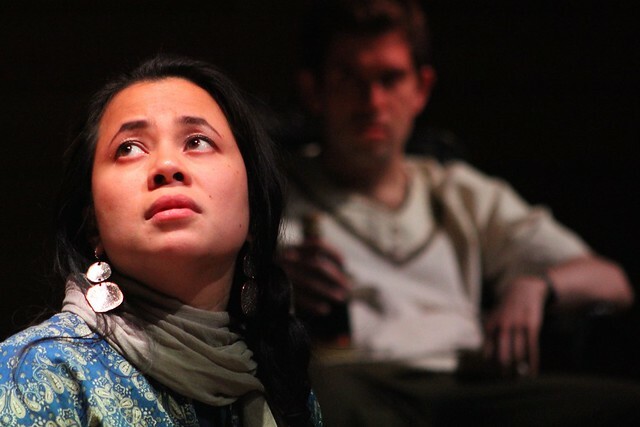 Forthcoming performances include Messenger Aida (South Downs Opera). Recent performances include Aeneas/Sorcerer/Sailor Dido & Aeneas (The Chigwell Choir), Giuseppe La Traviata (Opera Lyrica) and Cortigiano The Hospital of Incurable Madness (Solomon’s Knot Collective at Aldeburgh). Rhys performed in Alexander Campkin’s Three to Midnight at Tête à Tête: The Opera Festival 2012. Steven East’s (bass) recent roles include: Prince Gremin, Leporello, Dulcamara, Capellio, Sparafucile, Sarastro, Sacristan, Dr Grenvil, Zaretski, Dr Bartolo and The Pirate King. Chorus work with ENO includes The Queen of Spades, Carmen, The Mastersingers of Nuremburg, The Girl of the Golden West, Otello, Fidelio and Peter Grimes (covering Swallow) for Grange Park. Thomas Humphreys (baritone) studied at the Royal Academy of Music. He made his debut with Glyndebourne Touring Opera as Flora’s Servant in La Traviata and performs often with Glyndebourne, Opera Holland Park and English Touring Opera. In competition, he most recently won the Thelma King Award. Thomas is an avid recitalist, often performing with his wife Raya Kostova in venues across the UK and Europe. Melanie Lodge’s (mezzo-­‐soprano) many roles include: Carmen/Mercedes Carmen, Rosina Barber, Despina Così fan Tutte and anything else ending ‘ina’. G&S roles include: Kate, Phoebe, Pitti-­‐Sing, Peep-­‐Bo and Daphne in the little known Thespis. Favourite role to-­‐date is Beggar Woman Sweeney Todd. New works include creating Elf Jack Frost. Lily Scott (soprano) has just graduated from her classical vocal studies course at Leeds College of Music and will begin her MMus at King’s College London this September. Recent operatic roles include Ruth Pirates of Penzance and Tytania Midsummer Nights Dream. Future performances include contemporary classical song recitals at Steiner House and Fairfield Halls. Jessica Hill (dancer) trained at Tring Park School for the Performing Arts. Before graduating, she worked as an apprentice with Ballet Theatre UK, following her apprenticeship with the company she went on to become a principal with the company and perform roles such as the Black Swan and the Little Mermaid.